In this blog, I explain how the Gartner Magic Quadrant (GMQ) works. 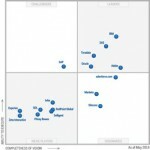 In my next blog, I’ll review some of the criticisms levelled at Gartner’s analysis. Gartner’s MQ analysis is market-segment or application-specific. It has to be because users need to be able to compare apples with apples. For example, there is one MQ for multichannel campaign management products and another for data centre outsourcing services. There are, in fact, thousands of MQ’s. MQ’s do not provide an exhaustive analysis of every vendor in a market. Gartner says it considers a vendor’s market share, revenue, number of clients, installed base, types of products/services, target market or other defining characteristics before adding them to the dataset. Gartner claims that “these criteria help narrow the scope of the research to those vendors that Gartner considers to be the most important — or best suited to the evolving needs of Gartner’s clients as buyers in the market.” Data are collected from a number of sources that may include surveys of vendors, interviews with reference customers, published reports, and Gartner’s own primary research. The data allow Gartner to classify vendors against two clusters of criteria. The first cluster measures the vendor’s Completeness of Vision and the second cluster assesses the vendor’s Ability to Execute. These clusters of criteria allow Gartner to assign vendors to one cell of a 2 x 2 matrix, as in the example here (multi-channel campaign management): Leaders score higher on both axes: the ability to execute and completeness of vision. These are often larger, mature businesses. Challengers score higher on the ability to execute but lower on the completeness of vision. These are often larger, settled businesses with plans for development. Visionaries score lower on the ability to execute and higher on the completeness of vision. These are typically smaller companies. Niche players score lower on both criteria: the ability to execute and completeness of vision. Market understanding: The ability of a vendor to understand buyer needs and translate these needs into products and services. A vendor that shows the highest degree of vision listens and understands what a buyer wants and needs, and can use that information to shape or enhance the relationship. Marketing strategy: A clear, differentiated set of messages consistently communicated throughout the organization and publicized through online presence, advertising, customer programs, events and positioning statements. Sales strategy: A strategy for selling products that uses the appropriate network of direct and indirect sales, marketing, service and communication affiliates to extend the scope and depth of a vendor’s market reach, skills, expertise, technologies, services and customer base. Offering (product) strategy: A vendor’s approach to product development and delivery that emphasizes differentiation, functions, methodology and features set in relation to current and future requirements. Business model: The validity and logic of a vendor’s underlying business proposition. Vertical/industry strategy: A vendor’s strategy to direct resources, skills and offerings to meet the needs of market segments, including vertical industries. Innovation: Marshalling of resources, expertise or capital for competitive advantage, investment, consolidation or defence against acquisition. Geographic strategy: A vendor’s strategy to direct resources, skills and offerings to meet the needs of regions beyond the vendor’s “home” or native area, directly or through partners, channels and subsidiaries, as appropriate for that region and market. Products/services: Core goods and services offered by the vendor that compete in and serve the market. This category includes product and service capabilities, quality, feature sets and skills (offered natively or through original equipment manufacturers) as defined in the market definition or further detailed by other criteria. Overall viability: Includes an assessment of the vendor’s overall financial health, the financial and practical success of the relevant business unit, and the likelihood of that business unit to continue to invest in and offer the product within the vendor’s product portfolio. Sales execution/pricing: The vendor’s capabilities in presales activities and the structure that supports them. This criterion includes deal management, pricing and negotiation, presales support and the overall effectiveness of the sales channel. Market responsiveness and track record: Ability to respond, change direction, be flexible and achieve competitive success as opportunities develop, competitors act, customer needs evolve and market dynamics change. This criterion also considers how responsive the vendor has been over time. Marketing execution: The clarity, quality, creativity and efficacy of programs designed to deliver the vendor’s message to influence the market, promote its brand and business, increase awareness of its products and services, and establish a positive identification with the product, brand or vendor with buyers. A combination of publicity, promotions, thought leadership, word of mouth and sales activities can drive this mind share. Customer experience: Relationships, products, and services and programs that enable clients to succeed with the products evaluated. This criterion includes the ways customers receive technical support or account support. It can also include ancillary tools, customer support programs (and their quality), availability of user groups and service-level agreements. Operations: The vendor’s ability to meet its goals and commitments. Factors include the quality of the organizational structure, such as skills, experiences, programs, systems and other vehicles that enable the vendor to operate effectively and efficiently. Posted in: customer relationship management CRM.